24″ x 20″ acrylic on canvas 2011. Private collection. Chris Gollon was interviewed about this painting and the techniques he used: “Whilst enjoying my Residency at Durham University in 2011, I ran out of materials and had to make a trip to Newcastle. In the art supplier’s in the centre of town, I was struck by some canvases that were primed with transparent gesso. Thus one could paint on this surface without fear of shrinkage, while at the same time appearing to work on raw canvas. I decided to pay a little more attention to the negative spaces in the painting, and to make it easier for myself I brought the objects closer together. 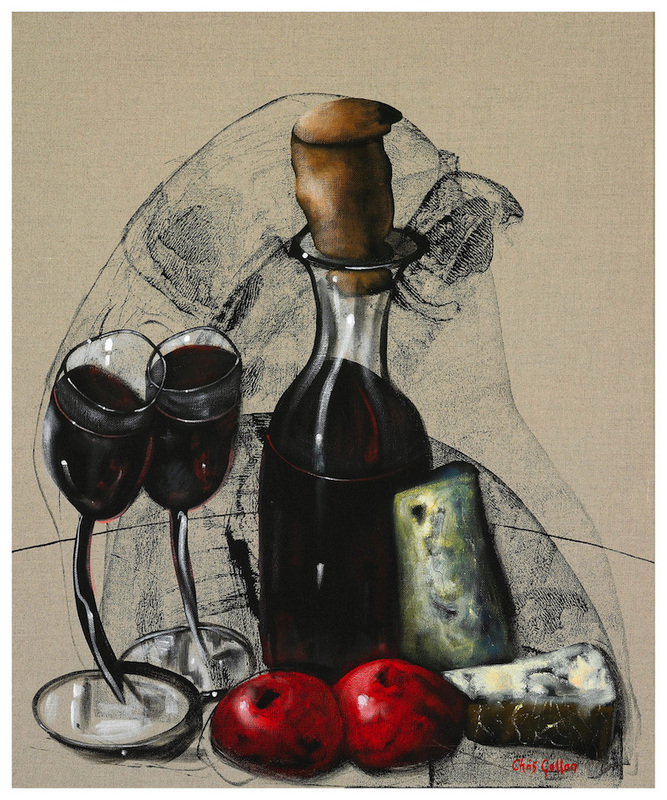 The fruit, cheese, wine bottle and glasses are simply blocked in with black acrylic gesso. Then using a printmaker’s roller, I went back in to the still-wet gesso to make the horizon, shadows and sweeping movement. Although one gets better at this with practice, it is still a risky business. You never know quite how it is going to come out. One can work into black gesso with lighter colours without fear of the black working through to the surface over time. 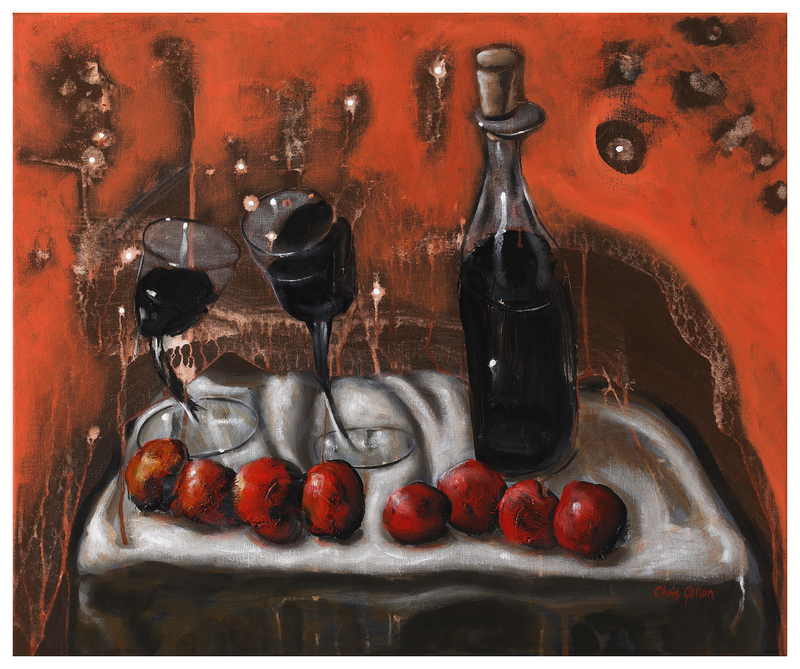 I was therefore able to work up the fruit with cadmium red1, blended in with fingers or a rag, and highlight applied with white4 into the still-wet paint. 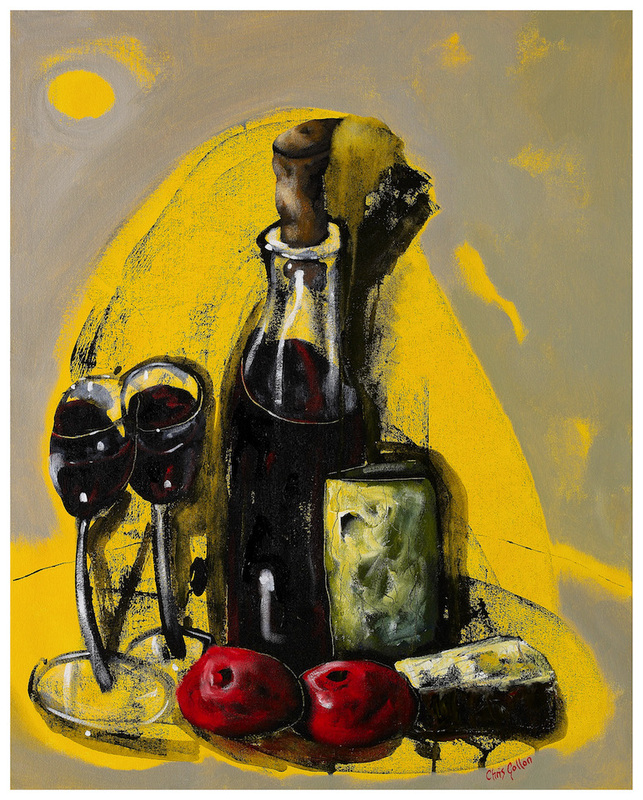 The cheeses were made using fingers, the wrong end of brushes, a palette knife and rags. The wine was subtly coloured with muted red and white highlights. 30″ x 22″ (76 x 56cm) acrylic on paper 2015. Available from IAP Fine Art. To enquire about this painting, please contact us. The first version of this painting appears on p.142 of Tamsin Pickeral’s biography Chris Gollon: Humanity in Art . This version, seems as if it is the same couple, but much further on in their relationship. 20″ x 24″ (51 x 61cms) acrylic on canvas 2010. Private collection. Installation with seven canvases, 60″ x 36″ (152 x 61cm) acrylic on canvas 2004. Available from IAP Fine Art. To enquire about this painting, please contact us. 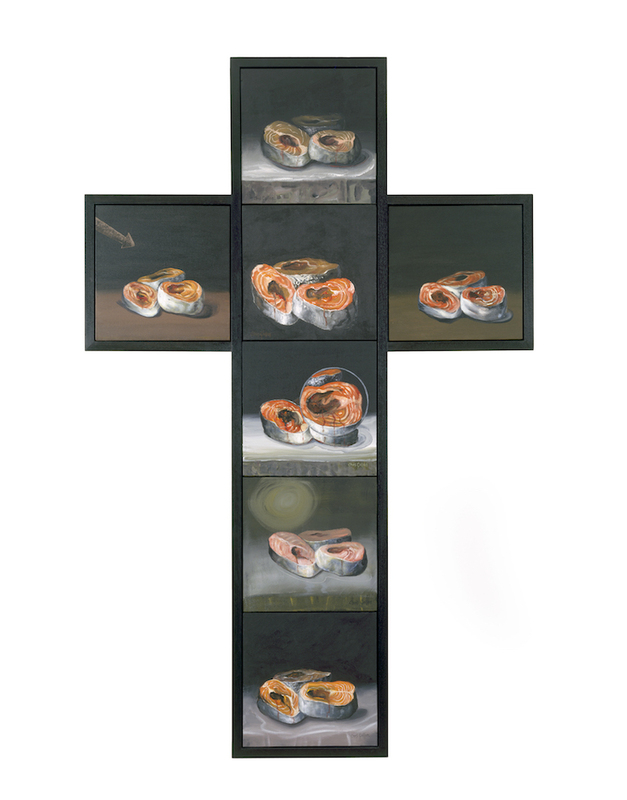 This work was originally titled ‘Cross (after Goya), but was then re-thought and re-worked for the Eleanor McEvoy inspired NAKED MUSIC series and her song ‘Deliver Me’. 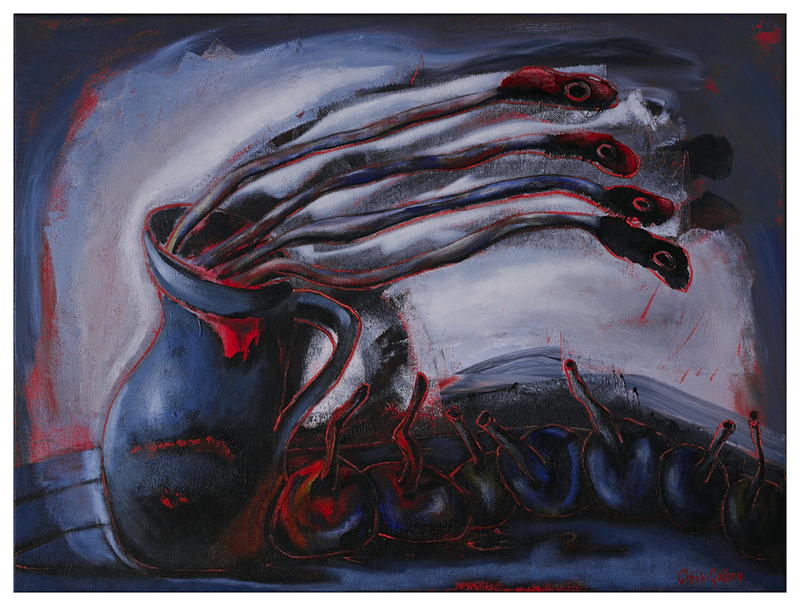 This painting features in art historian Tamsin Pickeral’s biography, CHRIS GOLLON: Humanity in Art (Hyde & Hughes, 2010). See Publications page for details. Goya was the first painter in history to paint meat or game without any culinary implements, making it more a mute accusation of murder. Chris Gollon takes this a stage further, making a Cross from salmon still life. To heighten the poignancy of the piece Gollon made use of one of his magnifying circles positioning it on a panel at the rough location that the centurion’s lance speared the side of Christ. 48″ x 36″ (122 x 91cms) oil on canvas 2012. 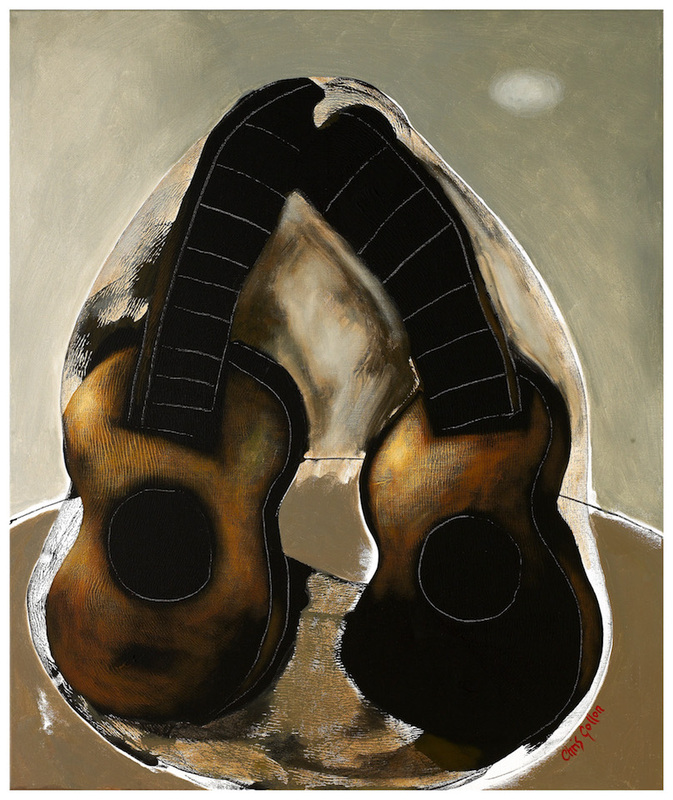 Available from IAP Fine Art. To enquire about this painting, please contact us. Chris Gollon said of this work: “Towards the end of 1888 two as yet unknown artists were working together in The Yellow House in Arles. During a turbulent 9 weeks, Vincent Van Gogh and Paul Gauguin–as a result of extreme rivalry and collaboration–produced some of the greatest masterpieces of the late nineteenth century. Their main argument was that Gauguin thought one should paint from the imagination and Van Gogh from life. This was in part due to their differing religious backgrounds. They both thought that art could be the new religion. Each artist tried to persuade the other of the validity of their own approach. Gauguin, as it turned out, used both methods. Whereas, for Van Gogh, painting from the imagination was a very perilous activity indeed. In mid-November, Vincent decided to paint his own chair to demonstrate the power of working from the motif. In an hour or two, he made one of the most iconic images in all of art. Still life painting up until that day had nearly always been about wine, flowers, foodstuffs etc.. To paint an unoccupied chair was unprecedented. 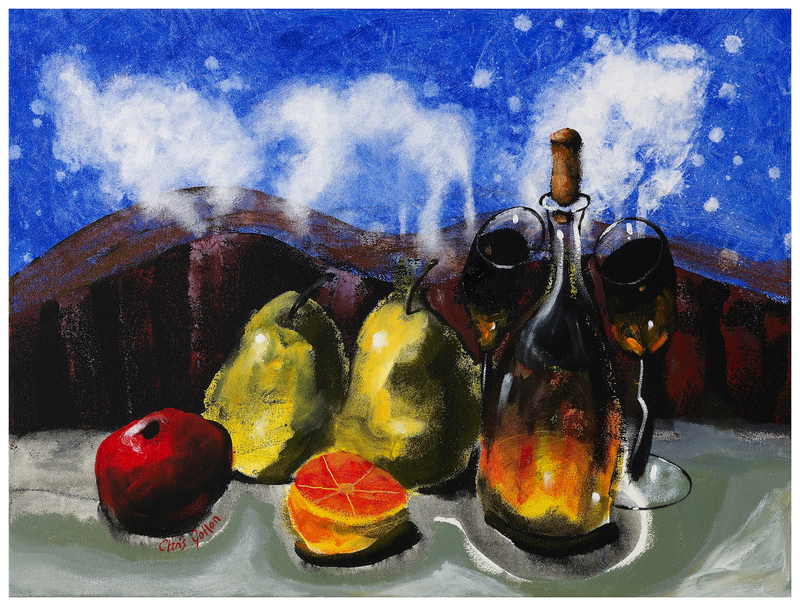 Unwittingly, and at the highest level, he had expanded the whole genre of still life. 20″ x 39″ (51 x 99cm) acrylic on canvas 2007. Available from IAP Fine Art. To enquire about this painting, please contact us. 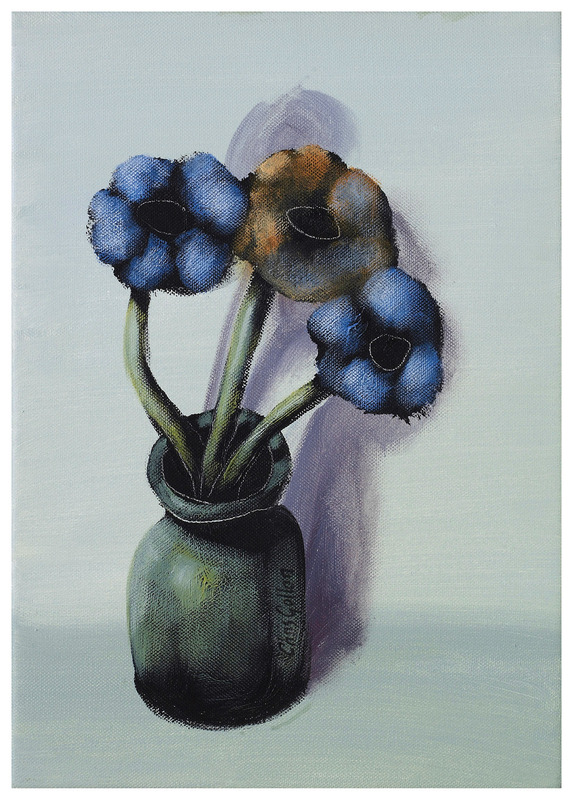 This painting features in Tamsin Pickeral’s biography Chris Gollon: Humanity in Art . See Publications page for details. 20″ x 16″ (51 x 41cm) acrylic on canvas 2008. Private collection. See Museum Acquisitions for more details on Gollon At Henley. 24” x 18” (61 x 46 cms) acrylic on canvas 2012. Private collection. 30″ x 22″ (76 x 56cm) acrylic on paper 2015. Available from IAP Fine Art. To enquire about this painting, please contact us. In her biography Chris Gollon: Humanity in Art art historian Tamsin Pickeral devotes a chapter to his innovative still life, pointing out: “Gollon’s still life convey a heightened sense of animation, of perceptible drama and emotional consequences more familiarly seen in figurative works.” She also remarks that this crossing the boundaries of genre, or indeed blurring the lines between genres, is a great strength in the artist’s work. “Gollon’s unique redefinition of painting genres to suit his own end is achieved with striking simplicity through his application of a consistent and unifying ideology. This singular approach, which underpins all his work is based on his perception of emotive forces in all aspects of his world. 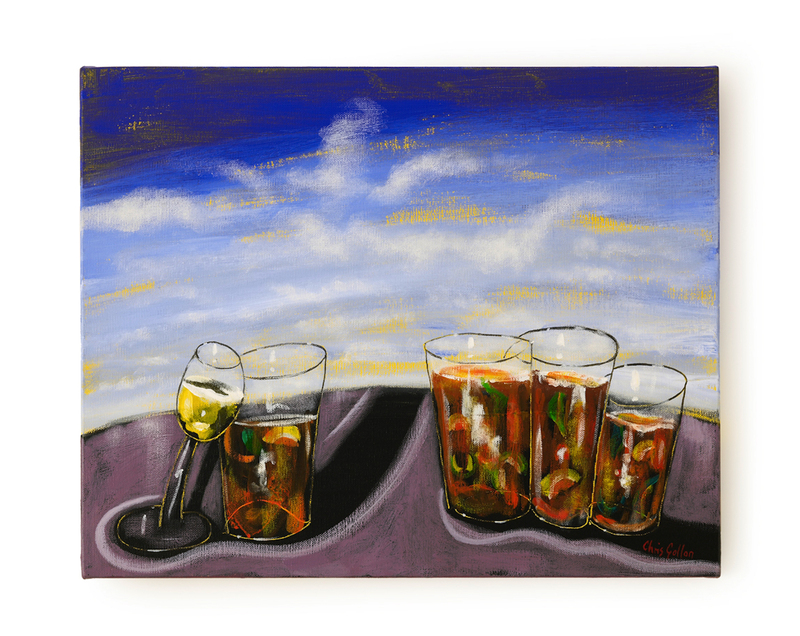 As such the artist sees individual identities and dramas in inanimate objects such as pots, wine glasses or musical instruments….”. 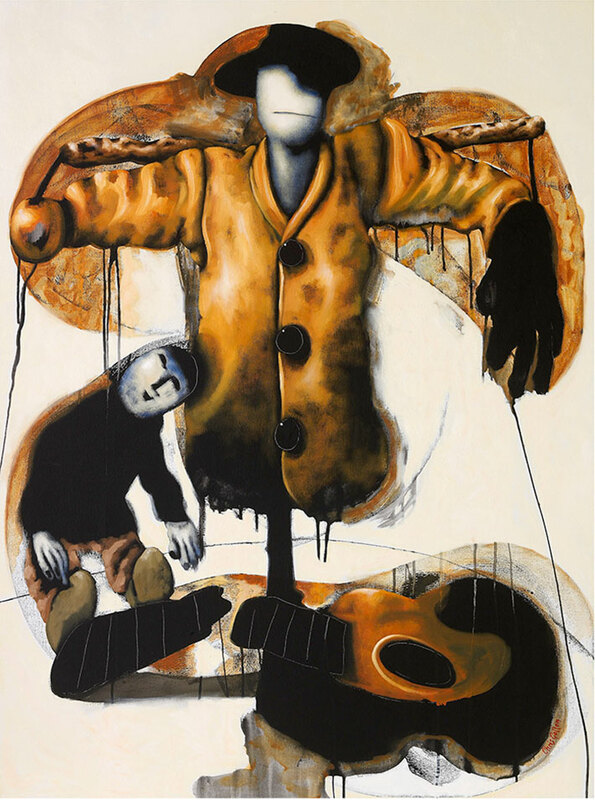 Chris Gollon is mainly known as an extraordinarily imaginative painter of the human figure and of human dramas. 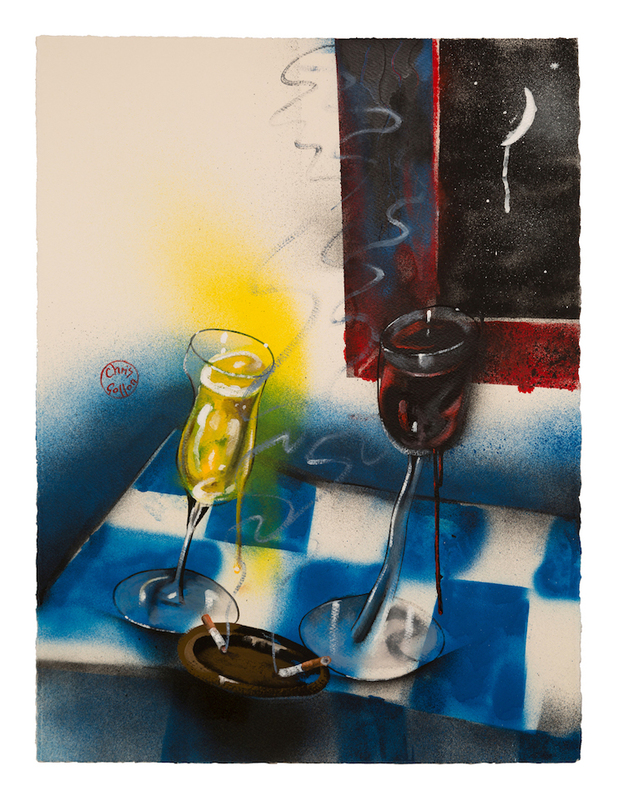 However, he is equally innovative in the genre of still life. 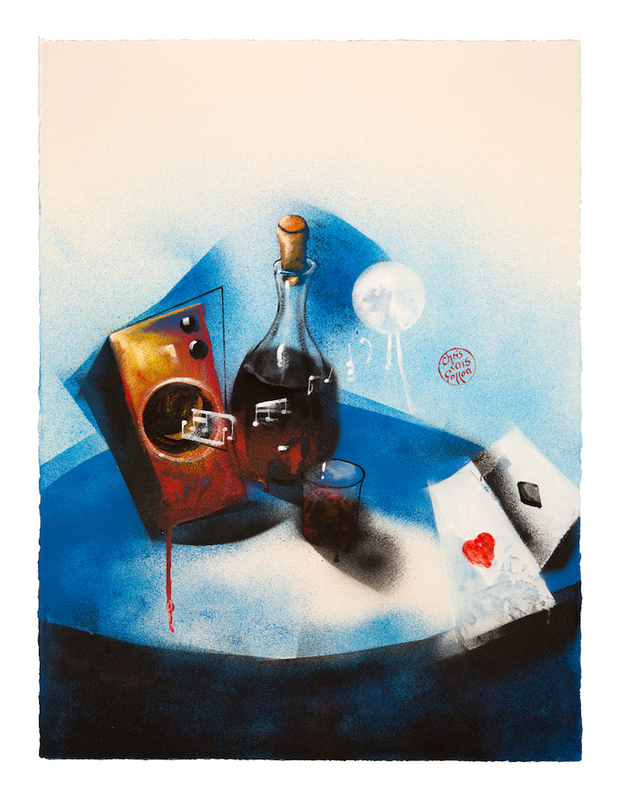 Gollon’s still life retain an essence of humanity, the objects he paints strangely seem to represent human dramas or interactions. The shadows are deliberately painted wrongly, which then animates the objects. Without going anywhere near Walt Disney, with great subtlety, Gollon’s glasses of wine nonetheless seem plunged into conversations or embraces, morsels of cheese or bottles of wine seem to be either spectators or an unsettling or chastening presence beside the chattering or smooching glasses. These effects are very subtle, with the objects in an undefined space somewhere between an interior and a landscape, lending them a curious air of mystery, which then leads the viewer to a human drama beyond the canvas. 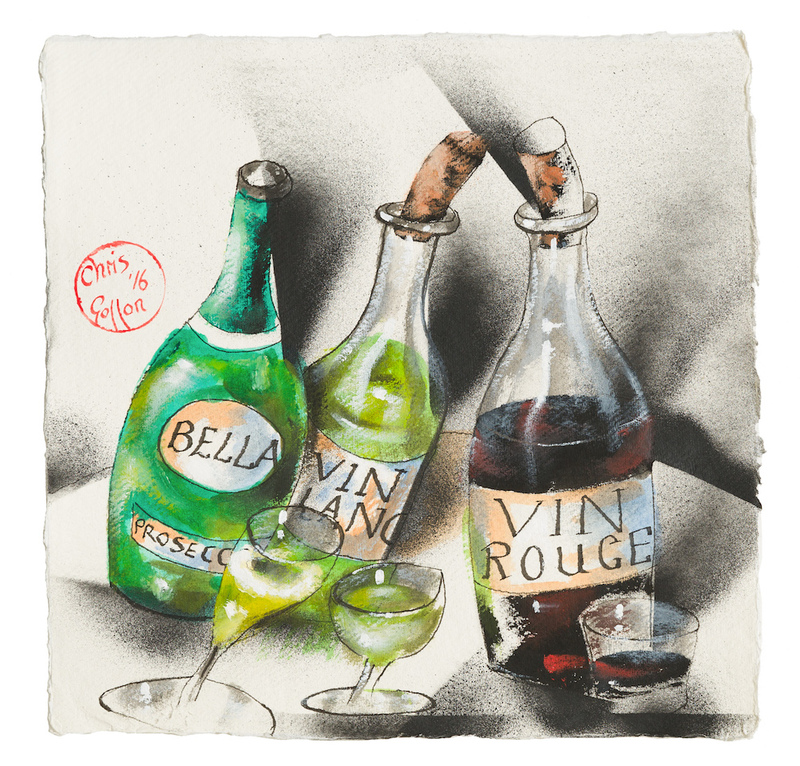 Some artists have been accused of flatness when using acrylic paints, but Chris Gollon finds a way of using Old Master techniques of very fine washes and glazes, combined with the use of a printmaker’s roller, reverse techniques derived from monotypes and other new methods to give movement, life and voluminous effects.